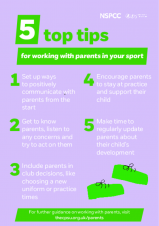 Parents play a vital role in encouraging and supporting their child's participation, success and fun when playing sport. It is essential that sports clubs communicate regularly with parents so that both coach and parent work towards the same goals. To raise awareness of this, from 1st to 7th October 2018 North Yorkshire Sport are supporting the Child Protection in Sport Unit with Parents in Sport Week, which focuses on the role of sporting parents in helping young people reach their full potential. Make sure you are following us on Twitter @NorthYorksSport for latest news on Parents in Sport Week 2018. 1. Ensure parents recognise their role in keeping children safe in sport – It's a big decision for parents to leave their child in the care of someone else. 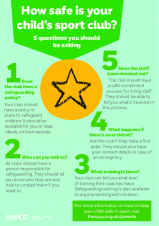 We are asking sports organisations to provide the information that parents need to make an informed choice about the club or activity their child attends and what to do if they have a concern. 2. 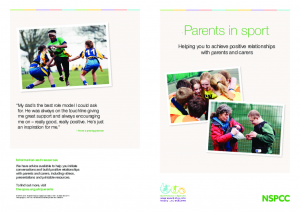 Help parents understand how to positively influence their child's enjoyment and wellbeing in sport – We are encouraging parents to look at how their behaviour and involvement influences their child's enjoyment of sport, through the resources on our website and that of the Child Protection in Sport Unit (CPSU). 3. Encourage clubs to engage and involve parents in their child's sport – This is a chance for clubs and coaches to showcase their creativity, and show how they will engage directly with parents. Why not try something new. It could be an event for parents, or a change in policy that ensures parents are more involved in the sporting lives of their children. In these short videos young people talk about the support they've received from thier parents to get involved in sport and send some key messages to parents about the kind of support they can offer. This video shows several children involved in different sports describing how the behaviour of parents and spectators deteriorates when they wear their 'magic sports kit' – that is, when they compete.